Egypt’s War on Terror has become a defining feature of Abdel-Fattah El Sisi’s presidency, and the provision of security a top priority. This is especially the case because of the sensitivity of the current period of political and economic transition, including ongoing parliamentary elections, large economic projects like the recently completed expansion of the Suez Canal, and a need to continue to bolster the tourism that has struggled since the 2011 uprisings. Just over a year ago, the Tahrir Institute for Middle East Policy (TIMEP) published a report that examined trends in violence from January 2010 through August 2014. The report found that terror violence in Egypt became more pronounced, more organized, and was taking place in new locations over that time. Since the publication of that report, all of these trends have intensified: the last year has seen hundreds of attacks take place across the country, a sustained insurgency in North Sinai, the emergence of new terror groups, and the arrival of the Islamic State to the Egyptian scene. The current wave of violence thus inspires a critical question: After more than two years of concerted efforts in a war on terror, why is Egypt facing an ever-increasing security threat? The answer to this question is highly complex. Egypt’s Rising Security Threat investigates the phenomena that have contributed to actors’ desire to carry out violence, and considers this violence as deeply rooted in environmental conditions that have allowed for its evolution. The report details the changing nature of Egypt’s security threat, explores Egypt’s security strategy over the course of the past year, and provides recommendations for policymakers to effect a more suc- cessful strategy. The first sections of the report deal with the local, national, and transnational contexts in which terror groups have operated over the past year and compares trends in violence to its causes and conditions. It then attempts to define the Egyptian security strategy, situating it in a global understanding of effective security strategy. The final sections of the report outline recommendations for Egyptian as well as U.S. and international policymakers to better advocate for effective policy. 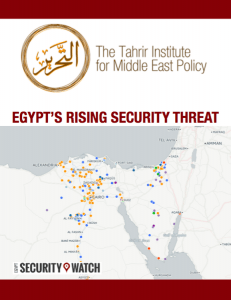 The report is a product of the Egypt Security Watch project, the only one of its kind to offer original content on the security situation in Egypt as a whole. With this project, TIMEP explores causes and implications of the proliferation of terror violence in the country and makes sense of the ways in which Egypt’s war on terror has and has not been effective. Through unique efforts to aggregate official, news media, and social media reports, the project addresses not only the complex relationship between terror acts and state response, but also the larger political landscape in which these developments occur. It is a live project, continuously monitoring reports from the ground, drawing on a deep network of experts, and tracking media from state and non-state actors, constantly revising content to provide the most accurate and timely information.